Hurricane Update – Yesterday I gave a summary on how the lead up to Hurricane Matthew is impacting us. I also mentioned the toll it might take when it actually reaches us. Here is the thing: Weather forecasters are having a tough time charting the exact track of Hurricane Matthew. It keeps moving around, causing frustration not just for weather people but for citizens trying to make plans. However, no matter what course the hurricane takes, our area in Myrtle Beach is going to feel the presence of it in someway. Hurricane Matthew is still not expected to directly hit our area but strong on-shore winds do figure to give us some problems. We are also expected to receive MORE than 10 inches of rain. Because our soil here in Myrtle Beach is already saturated, this could give us some real issues. I took this photo of a TJ Maxx this morning as I was coming back from the gym. 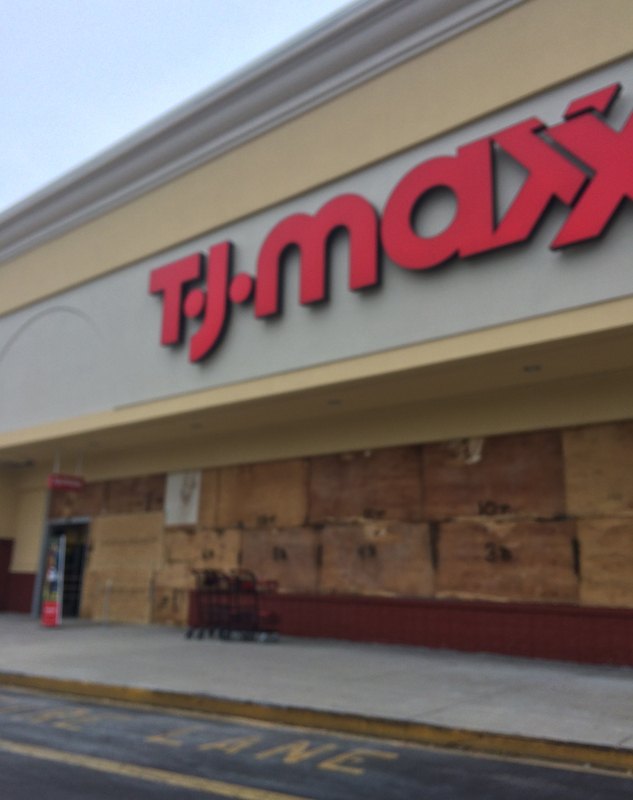 The store boarded up its windows in preparation for the storm. Alternative Places to Exercise – Because the Coastal Carolina campus is closed, so is the gym. This has forced me to go elsewhere for my workouts. Yesterday I went to ultra fancy Planet Fitness. This morning I got my pump in at traditional Gold’s Gym. Talk about the tale of two gyms! Planet Fitness was modern and large. Gold’s Gym was old school and small. Although I prefer working out at my home gym, venturing out these past two days hasn’t been too bad; in fact, I have kind of enjoyed it. 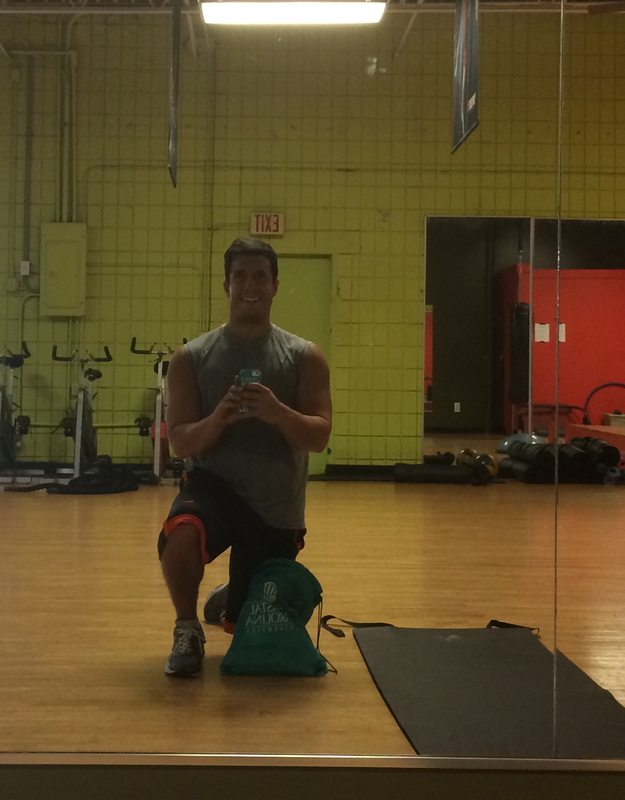 This is me taking a selfie inside the old school facilities of Gold’s Gym this morning. A Good Business – I want to give a shout out to the person who helped us with the chalk art portion of our baby announcement. Brooke Holden provided us with the board and wrote the actual text on it. She was very helpful, affordable, and quick. Brooke specializes in weddings. 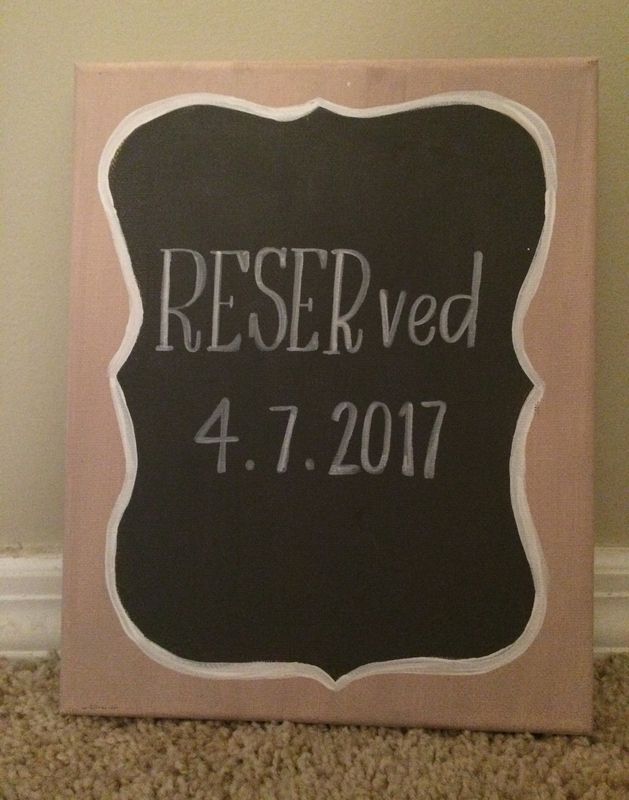 If you have any calligraphy or chalk art needs, I highly recommend you take a look at her website. This is the sign that Brooke Holden made for us. Happy Birthday, Steph! – Last night we celebrated my sister-in-law’s birthday. Stephanie turned 34 and we celebrated with a little get together at her house. We enjoyed pizza and then ate cake and ice cream. We finished the night by watching her open presents and by playing with the kids. 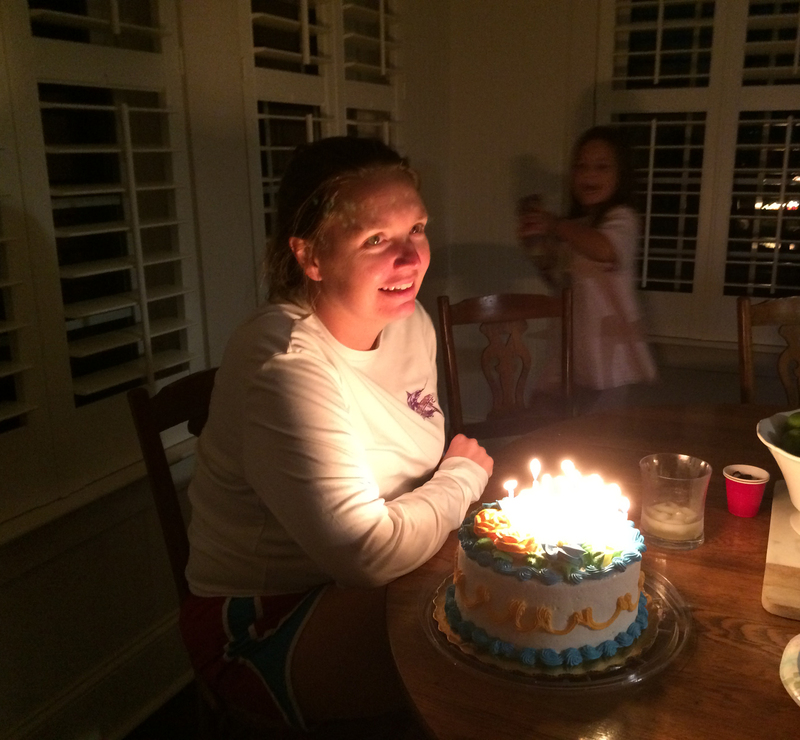 One final happy birthday wish to my great sister-in-law! A scene from Steph’s birthday celebration last night. Our Newest Show – Sidney and I have a brand new network show we are watching! “This Is Us” is a program on NBC that chronicles the adventures of triplets. Well, I am using the term “triplets” lightly since one of them is not biological to the two others. Anyway, Sidney got me to watch the premiere and the second show was equally as entertaining. Making things even more interesting is that my family out west is also watching the show so it gives us something to talk about with them. If you are looking for something to watch on Tuesday nights, I recommend it! If you live in South Carolina, please be safe this weekend. Thanks to everyone who has been thinking about Sidney and I. Like I said yesterday, I think we are going to be just fine. Don’t Blink. This entry was posted in Uncategorized and tagged Gold's Gym, Hurricane Matthew, Planet Fitness by brent. Bookmark the permalink.